Throughout my travels over the past couple months, I've put together some tips for anyone gearing up for a business excursion who needs a little help fitting their monster sized to-do list & endless pairs of shoes inside a compact carry-on. First order of business: create member rewards accounts for both your flight carriers, as well as your preferred hotels. When you're booking your travel, it's best to try and stick to 2-3 different carriers to ensure you're stacking up as many frequent flyer miles from the same airline as possible. Same goes when you're booking your hotels: try and keep your stays consistent within the same hotel group to maximize your ability to cash in on your free rewards. Traveling for business may be a pain, but the free weekend getaway paid for by perks - paid for by your company - makes it all worth it! If you Google search "Packing Tips", the never-ending list of websites will give you a number of tips on developing a strategy that all say the same thing: only bring the things you absolutely need, and bring clothing items that you can wear multiple days. Let me just tell you, I don't do either of those things. Limit the amount of shoes (killer I know) because they undoubtedly take up the most space. Along with your trusty pair of black suede booties or patent leather Mary Janes, tuck a compact pair of cheetah flats into the side compartment of your bag. Cheetah print is the best print for jazzing up a neutral outfit, as it can easily pair with your trusty pair of tan trousers, giving them the funky upgrade they've been longing for! 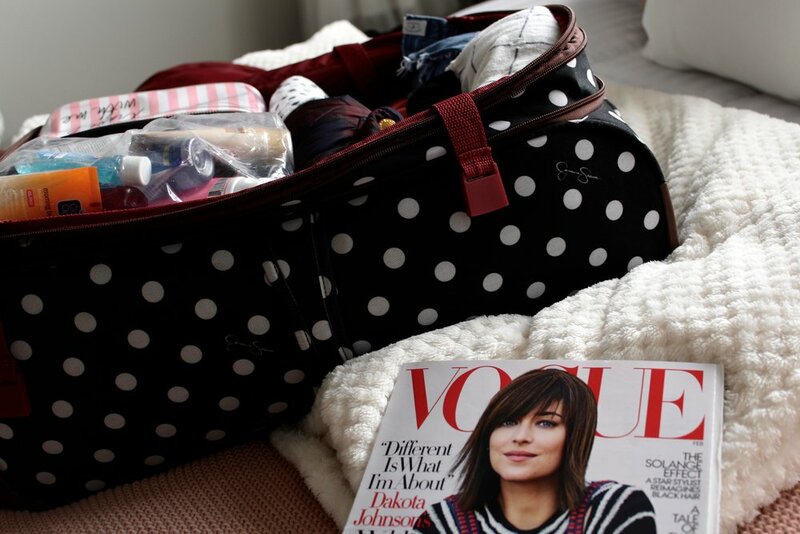 Don't pack a purse in addition to your carry-on and work bag. This was a hard one for me. I love a good handbag just as much as the next girl, but condensing my work bag + everyday essentials into one tote was a game changer! I found an adorable Steve Madden Totethat serves as both my work bag when I'm commuting from my hotel to my office, as well as my oversized purse when we go out for dinner & drinks at night. This saves room in the suitcase for sure, but there's also nothing more annoying than packing a purse inside an over the shoulder bag. I don't know about you, but every time I reach inside to reapply lip gloss, I don't want to be digging around forever. I love you, my trusty Raspberry Sorbet lip gloss- but not enough to spend more than exactly 3.5 seconds looking for you. I've got a plane to catch! Wear or carry your heavy coat on the plane. I'm the lucky business traveler who departs the chilly Midwest and heads to the bitterly freezing East Coast so it goes without saying that I can't travel without my winter coat! Despite the plane sometimes getting rather toasty, your suitcase will sincerely thank you for not cramming a big puffy coat inside it. If you're like me and suffer from Chronic Running Late Disorder, don't you fret! TSA Pre Check was pretty much made for busy business travelers who don't have time to wait in line (and okay- who also insisted on stopping for a coffee on the way to the airport). Perhaps the best perk of TSA Pre Check is that you basically get to hop to the front of the security line, no questions asked. Talk about VIP status! Another bonus is that you don't have to take off your shoes like a peasant when walking through security -gross!- and you can keep your laptop and liquids in your bag, as well as not have to remove your jacket. Big ups for TSA Pre Check! I just recently got my first credit card, so in other words- look out world! In all seriousness though, I'm doing myself a great big favor by earning some credit as well as earning some fantastic rewards throughout my traveling adventures! I have a cash rewards credit card, meaning for every dollar I spend I get cash back. Pretty cool, huh? However, depending on where your particular interest lies, you can choose from tons of different credit cards and carriers to accommodate what types of rewards you want to earn. When I travel, I exclusively use my credit card to pay for food, Ubers, and the occasional 2 scoops of Ben & Jerry's post late nights at the office. After I submit all my receipts, I wait patiently for both my credit card bill, as well as the reimbursement of my travel expenses on my paycheck. Once I get reimbursed for my travel expenses, I immediately pay off my credit card and I'm good to go! This method of payment is great for earning credit, yes- but it also eliminates the travel-strain on my personal checking account. On a normal week, I wouldn't eat out for all 3 meals + pay for transportation everywhere I go- unless of course it's my birthday week in which case, anything goes. But needless to say, it adds up pretty fast. Depending on where my trips fall during my pay cycle, I could potentially come home to a whole week to go with a minimal amount of money to last me till payday. The credit card addition to my travels has been working wonders, and the little cash back surprise at the end of the month doesn't hurt either. Despite the pain of airport-hopping and being on-the-go 100% of the time, traveling does have its fun parts. Visiting new cities can be fun & exciting, especially when you take advantage of your free time (and the fact that your company is paying for it!). Hit up the best local spots such as quaint coffee shops, trendy lunch bistros, swanky wine bars, and whatever else the town has to offer! I pretty much exclusively travel to Providence, RI and so I've come to find my own little hidden gems that I make a point to stop at each visit. However if you're traveling somewhere new each trip, go all out and Google the best restaurants or shops in the area. Stumbling upon an amazing cup of coffee paired with an exquisite muffin is totally worth waking up a little earlier in the morning! Making the most of your business travel will certainly brighten it up a bit, while inherently giving you something to look forward to throughout the whole trip. Dramamine, aka motion sickness’s worst nightmare! Hand sanitizer, because traveling is #gross. A good book or magazine, obvi. Headphones, so you can drown out the noisy snorer sitting next to you. Sunnies, because window seats can be brutal for those 6AM flights... Excedrin, because there's nothing worse than traveling -or just plain living- with a headache. Whether you work from home or you post up at far away coffee shops, make the most of your workday by enjoying every moment of the ride, however heavy your carry-on bag may be. Cheers to those of us who kill it both at home and from afar! came as a 3-piece set from TJ Maxx. I bought it about 3 years ago, but T.J. Maxx (& Marshalls) always keeps their travel sections fully stocked, so definitely keep them in mind when you're shopping for luggage! They have the cutest styles & prints for the best price.